Located in a historic downtown New York building, this loft has a challenging long and narrow shape, and the clients had a complex set of requirements: Both husband and wife work from home, they frequently entertain large groups, and they often have overnight guests. In addition to the kitchen, dining room, living room and master suite, the program included his and her offices, a den, a guestroom, a sitting/TV room, a second guest space, and space for a large book collection. The challenge was to accommodate all these functions within the tight 2,200-square-foot space. Finding room for the book collection was solved by designing a “double loaded” bookshelf system that can be accessed from both sides. 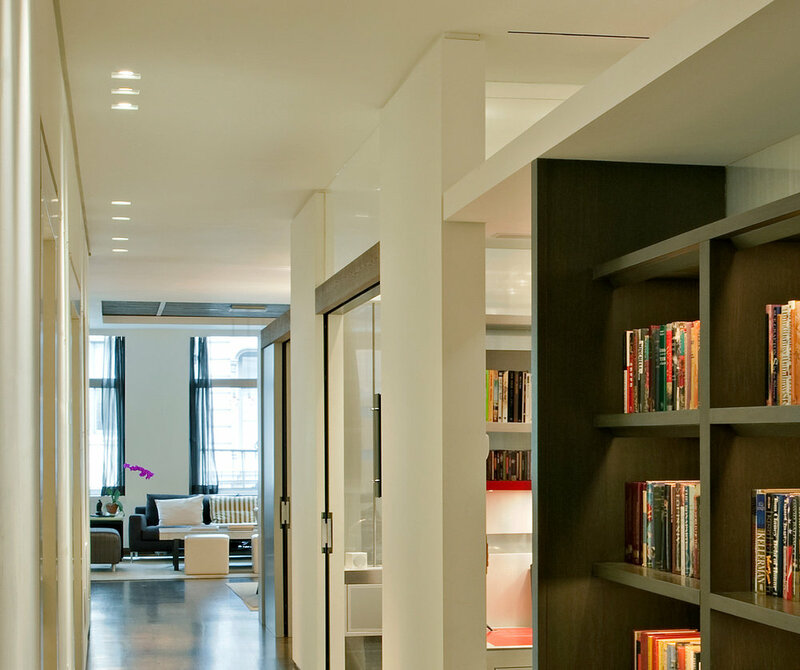 The books are lit with under-shelf, recessed linear lighting. A small den, which is equipped with a home theater system, is enclosed in glass, with glass sliding doors that allow private TV and movie watching. The living room additional seating area, with two Cab armchairs by "Cassina", is further defined by a wood ceiling recess and vintage pendants. The custom-made area rugs were designed by the architect. One side of the main corridor is a solid wall that provides separation for the private rooms. The other side is a wood and glass system that sets off semi-private spaces. The glass, which functions as a partition between the semi-private spaces, is two-layered, encasing a semi-transparent fabric that allows natural light from large windows at the west wall to penetrate the interior space. The sitting/TV space can transform into a second guest room by opening the sofa bed and drawing curtains over the wood-and-glass enclosure. The result is a highly efficient, planed space that provides for the clients’ needs and is also luxurious and meticulously detailed. The kitchen island top is hardwood combined with a stainless steel surface and the island sides are stainless steel. It includes a bar sink, a mini fridge and a wine cooler. The custom made bed, headboard, besides and bench were designed by the architect. The oversized door frame is made from stained white oak wood. The translucent glass panels in the double swing doors provide for privacy and also allow defused light to pass through. 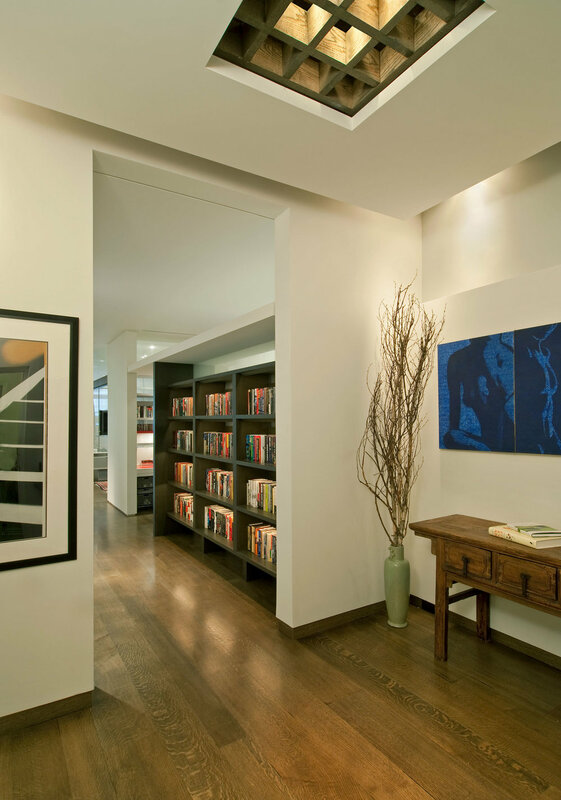 The cove lighting in a ceiling recess across the back wall, the concealed lighting in wall niches and the recessed ceiling lights are dimmable and can be controlled wirelessly. The lighting, sound systems and windows shading in the loft are controlled by an overall audio/visual wireless system. Bed, headboard and besides designed by the architect and custom made. 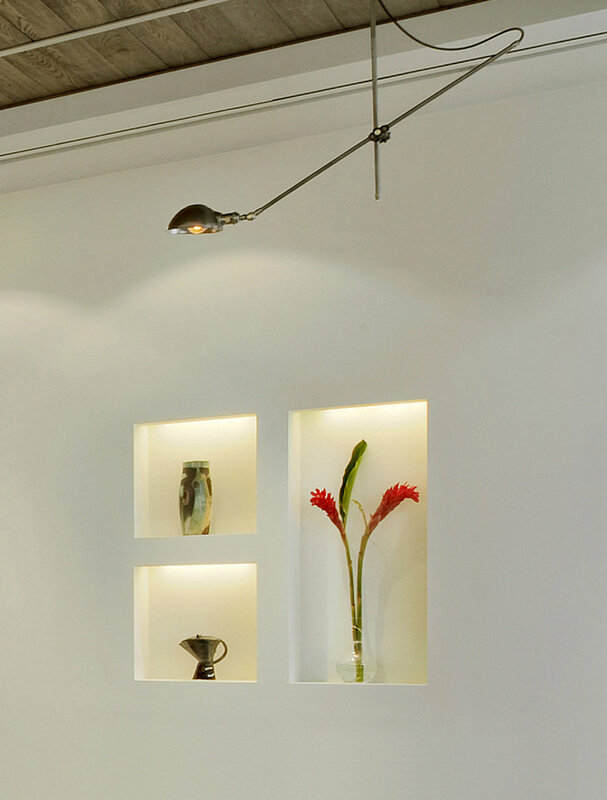 The concealed lighting is dimmable and can be wirelessly controlled for different light scenes. The home office/desk has built-in recess lighting and speakers, and an audio/visual system screen to control lighting and sound. Master bathroom - The custom made green tinted concrete bathroom sink was designed by the architect. The flooring is lightly tinted, quarter sawn oak and the walls are laminated with carrara marble mosaic. Powder Room - custom dark gray concrete countertop, white painted wood wainscot and lightly tinted, quarter sawn oak flooring.